Provide your guests with a stylish, spacious table where they can dine comfortably in your home -- the Dustin Dining Table from Sunpan. This exquisite table combines an impressive design with impeccable style to deliver a great mix of form and functionality. In addition, the dining table is exceptionally crafted and will provide sturdy support for years. Make the most of the space in your dining room with a one-of-a-kind table -- the Dustin Dining Table. Combines an impressive design with impeccable style to deliver a great mix of form and functionality. Deluxe top is crafted from the finest materials to provide a stunning look. The table's frame includes a coated metal base that will remain sturdy. Unique appearance makes the table an ideal fit in contemporary or transitional dining rooms. What is the Dustin table top made of ? 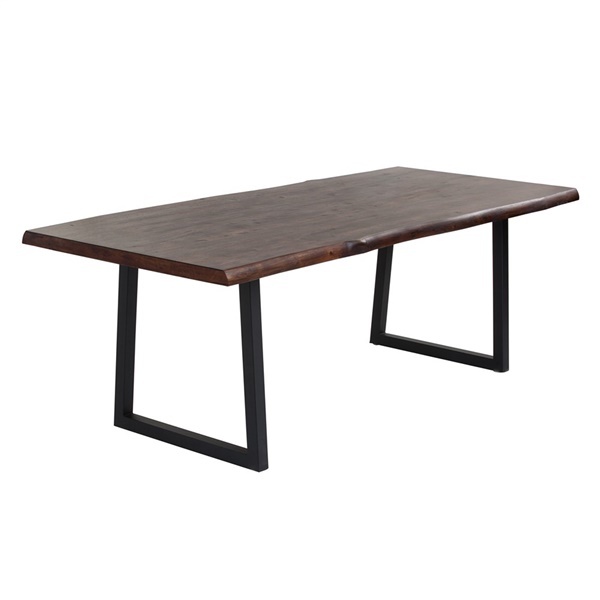 The Dustin Table top is made of solid acacia wood.